I just recently received the new Rode VideoMic GO. A very straightforward, no fuss, directional microphone under $100 dollars (found here) for your video camera. No batteries required, and will improve audio capture over using the internal microphone from the camera, and of course with an extension cable you can use this off-camera positioning this closer to your subject. Now i'm a big fan of the sound quality from a Rode VideoMic Pro (seen here). If you can hold off and save up, the Rode VideoMic Pro is a solid microphone to have in the kit. Realizing that we all have to start somewhere, the new VideoMic GO will offer you better sound capture options than working from your in-camera microphone, and this mic comes pre-built on the Rycote Lyre Suspension System (no rubber bands to wear out). 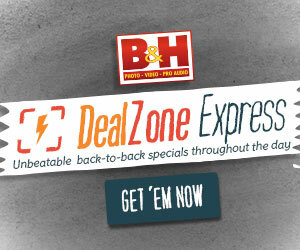 Check it out at B&H (click here). Posted in DSLR Audio, dslr video, Equipment Reviews, Rode VideoMic. Tags: DSLR Video Shotgun, Rode VideoMic Go, Video Microphone on February 10, 2014 by Emm. Although the new Zoom H6 has been released, I still see teams working with the Zoom H4n. Why not? It's a great audio recorder that really changed the way DSLR audio has been captured over the years. If you're not currently working with a professional audio recorder, now's the time. The Zoom H4n is currently on sale for an instant savings of $-100 OFF (limited supply). Now just $169, this is the lowest price i've ever seen since it's release. Check it out (here). Posted in DSLR Audio, dslr video, Zoom H4n, Zoom H6. Tags: Digital Recorder, portable audio recorder, Zoom H4n on December 10, 2013 by Emm. The VideoMic GO On-Camera Shotgun Microphone from Rode is a lightweight microphone which adds high-quality audio recording to your small camcorder and HDSLR camera. At only 2.6 ounces, the microphone keeps your camera setup lightweight, making it ideal for handheld shooting. It features an integrated Rycote Lyre shock mount for isolation from bumps and vibration, and offers battery-free operation, using instead the plug-in power from your camera's 3.5mm microphone input. Posted in DSLR Audio, dslr video, Rode VideoMic. Tags: Rode Shotgun Microphone, Rode VideoMic, Rode VideoMic Go, Rycote Lyre ShockMount on November 18, 2013 by Emm. Joe asks 'What cheap case can be used for small equipment?". If we're not talking about fragile equipment, I know a few people using these Plano 4 Pistol Foam Lined Cases. These aren't your waterproof air tight 'Pelican-Like' cases, but they still offer a fair amount of protection. With an internal dimension of 16" x 10" x 6", these pistol cases are large enough to hold monitors, portable audio recorders, microphone systems, battery chargers, and more. Typically these run between $25-35 dollars, but it's currently on sale today for under $12 dollars. Jump over to the page and you'll find other customers sharing images on how they use it with their camera gear (found here). For smaller equipment that I feel can take a few bumps, clear Organizing Tackle Boxes work great. The clear boxes take the guess work out of finding gear, all without having to open the box. You can organize and label areas such as 'new' or 'used' for batteries. The trick is finding a good set, and the ones I use are also from Plano. Not just durable, but 3" deep to hold fairly thick camera accessories such as LP-E6 Batteries. Overall storage dimensions are 10.5" W X 7"H X 3" Deep, and these run under $7 dollars (found here). Posted in Camera Bags, DIY Equipment, DSLR Audio, dslr video. Tags: Gear Box, Microphone Case, Monitor Case, Nanuk, Pelican, portable recorder, Storage Organizer, tackle box on November 2, 2013 by Emm. Here's another product Giveaway sponsored by Aputure and open to everyone. This time it's for Aputure's latest V-Mic directional condenser shotgun microphone complete with hotshoe shock mount, foam windscreen, and Deadcat (furry thing). Aputure V-Mic D1 is a directional condenser shotgun microphone featuring a super-cardioid polar pattern, line gradient acoustics, superior isolation, and easily filters out unwanted background noise, vibrations and low frequencies in order to give you accurate voice input. It also has a low battery indicator, and is equipped with a universal shoe mount, making it suitable for most DSLRs and camcorders. More about this Aputure V-Mic product Givewaway can be found at the following link (here). This is a fairly new product but you can find additional information, specs, and images from product listings over on eBay (click here). Posted in DSLR Audio, dslr video. Tags: Aputure V-Mic Shotgun Microphone on August 8, 2013 by Emm. There was a question about how to update the Tascam DR-60D Firmware, so here's a short video showing how it's done to update the DR-60D system to Firmware v1.20. The Tascam DR-60D Portable Digital Audio Recorder is available from B&H Photo Video (here). Posted in DSLR Audio, dslr video. Tags: Digital Recorder, portable audio recorder, Tascam DR-60D firmware, Update Tascam Firmware on August 2, 2013 by Emm.